Shows you how to integrate Flex and Spring to create a powerful platform for building robust Rich Internet Applications. Jon Rose Flex Pratice Manager, Gorilla Logic, Inc.
► WHy Flex and Spring? Adobe Flex Software is a popular framework for building Rich Internet Applications (RIAs). The Flex framework is used to create SWF files that run inside Flash® Player. The framework was built for use by developers and follows traditional application development paradigms rather than the timelinebased development found in the Flash Professional authoring tools. Applications are built using the Flex Builder IDE™ - an Eclipse-based development environment. ActionScript® 3 is used to access data and build user interface components for web and desktop applications that run inside Flash Player or Adobe AIR® Software. The Flex Framework also uses a declarative XML language called MXML to simplify Flex development and layout. The Spring Framework is one of the most popular ways to build enterprise Java applications. Unlike traditional Java EE development, Spring provides developers a full featured “lightweight container,” that makes applications easy to test and develop. Although Spring is best known for its dependency injection features, it also provides features for implementing typical server-side enterprise applications, such as declarative security and transaction management. Adobe Flex has strong ties to Java, which include an Eclipsebased IDE and BlazeDS, its open source server-based Java remoting and web messaging technology. In addition, most enterprise projects that use Flex build on a Java back end. With Flex and Java so often married together, it is only natural to want to integrate Flex with Spring-based Java back ends. Beyond greenfield development, many organizations want to revamp or replace the user interface of existing enterprise Spring applications using Flex. In late 2008, the Spring community recognized these cases and began working on the Spring BlazeDS Integration project to add support for Flex development with Java and Spring. By default BlazeDS creates instances of server-side Java objects and uses them to fulfill remote object requests. This approach doesn’t work with Spring, as the framework is built around injecting the service beans through the Spring container. The Spring integration with BlazeDS allows you to configure Spring beans as BlazeDS destinations for use as remote objects in Flex. 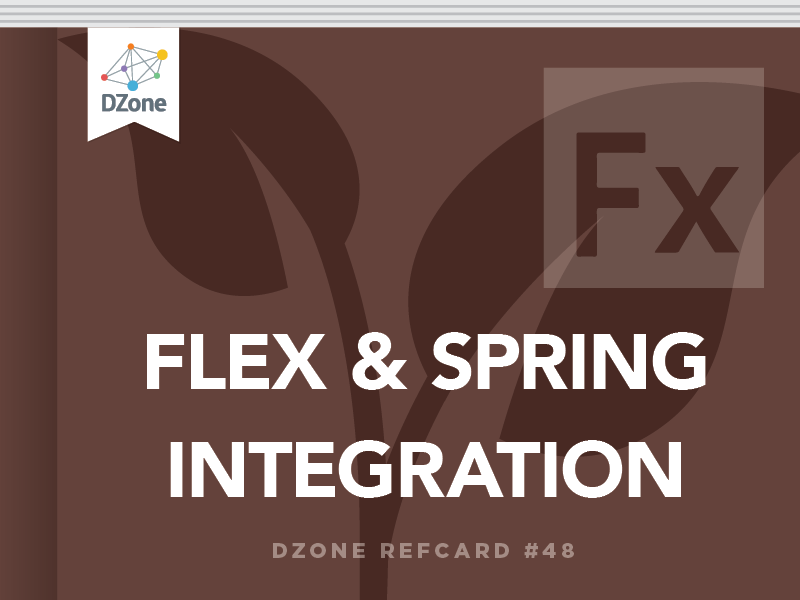 This Refcard assumes that you are already familiar with Spring and Flex. If you need an introduction or refresher to either, check out the Very First Steps in Flex and/or Spring Configuration DZone Refcardz. BlazeDS provides simple two-way communication with Java back-ends. Adobe Flash Player supports a serialization protocol called AMF that alleviates the bottlenecks of text-based protocols and provides a simpler way to communicate with servers. AMF is a binary protocol for exchanging data that can be used over HTTP in place of text-based protocols that transmit XML. Applications using AMF can eliminate an unnecessary data abstraction layer and communicate more efficiently with servers. To see a demonstration of the performance advantages of AMF, see the Census RIA Benchmark at: http://www.jamesward.org/census.The specification for AMF is publicly available, and numerous implementations of AMF exist in a variety of technologies including Java, .Net, PHP, Python, and Ruby. The open source BlazeDS project includes a Java implementation of AMF that is used for remotely communicating with server-side Java objects as well as for a publish/subscribe messaging system. The BlazeDS remoting technology allows developers to easily call methods on Plain Old Java Objects (POJOs), Spring services, or EJBs. Developers can use the messaging system to send messages from the client to the server, or from the server to the client. BlazeDS can also be linked to other messaging systems such as JMS or ActiveMQ. Because the remoting and messaging technologies use AMF over HTTP, they gain the performance benefits of AMF as well as the simplicity of fewer data abstraction layers. BlazeDS works with a wide range of Javabased application servers, including Tomcat, WebSphere, WebLogic, JBoss, and ColdFusion. First, set up the server-side Java web project in Eclipse by creating a web application from the blazeds.war file (found inside the blazeds zip file). Listings 1, 2, and 3 are very basic Java classes that you’ll use as examples for this tutorial. In a real-world application, the service implementation would likely connect to one or more enterprise services for data, such as a relational database. In this case, it simply returns a hard-coded set of entities as an ArrayList. The basic Java web project with the BlazeDS dependencies is now complete. Those familiar with Spring should recognize this as a basic Spring configuration for creating a simple bean from the MyServiceImpl class. Later in this tutorial you will be using this bean through BlazeDS. At this point, you have a basic Java web project with a default BlazeDS configuration. Now, you’ll change the default BlazeDS configuration to use the newly created Spring bean. To begin configuring Spring BlazeDS Integration, update the web.xml file by removing the default BlazeDS configuration and replacing it with the code from Listing 5. The web.xml contents in Listing 5 create a servlet filter from Spring that will process all BlazeDS requests at: http://localhost:8080/dzone-server/spring This will be the base URL for accessing the BlazeDS endpoint. Also, you should notice that this is a standard DispatcherServlet for Spring. Now that you have Spring wired into the Java web application, you will update the basic Spring configuration from Listing 4 so that it will work with BlazeDS. Add the highlighted section from Listing 6 to your application-config.xml file. Listing 6 exposes the MyServiceImpl class as a BlazeDS destination. First, the Flex® namespace is added to the configuration. Note that the XSD will not be published from Spring until the final 1.0 release, and until then you will have to add it manually to your XML catalog. With the Flex namespace added, the configuration uses the messagebroker tag to create the MessageBrokerFactoryBean. Since there is no additional configuration information provided, the MessageBroker will be created with “sensible defaults,” assuming that the service-config.xml is in WEB-INF/flex/ services-config.xml. The remote-service tag creates a destination from existing Spring beans. In Spring BlazeDS Integration release 1.0.0M2, the standard BlazeDS configuration file (servicesconfig. xml) is still used for configuration of the communication channels. Next, update the default BlazeDS services-config.xml file (found in the WebContent/WEB-INF/flex folder) to reflect the Spring URL defined in the web.xml file. Replace the contents of the file with the code in Listing 7. Note that the endpoint URL for the my-amf and my-polling-amf channels in Listing 7 include “spring” after the context.root parameter. This is the only configuration change you need to make in the BlazeDS default configuration files. All the remote destinations are configured in the Spring application-config. xml file. You are now done configuring the server-side Spring / BlazeDS Java application. You may want to start up the Tomcat server to verify that your configuration is correct. Your project will open in the MXML code editor and you’ll see a file titled main.mxml. Open the file and add the Flex® application code from Listing 8. This code accesses the MyServiceImpl class in Java and returns the results to Flex. The code in Listing 8 sets up the AMFChannel for accessing the Spring service. Note that the destination “flexMyService” is the same as the bean you defined in the application-config. xml Spring configuration file. Also, you might have noticed that none of the Flex code contains anything specific to Spring. The Flex code doesn’t have to change, as the client code has no knowledge of the fact that Spring is being used on the server. To get the dzone-server to update the deployed web application you may need to right-click the dzone-server project and select Refresh. Now you can right-click the main.mxml file and select Run As > Flex Application or Debug As > Flex Application. One of the benefits of using Spring is that it provides support for many common enterprise requirements, including security. In this section, you’ll expand on the basic application by using Spring Security to protect the service channel with role-based authentication. This configuration allows the user to authenticate through the Blaze DZ channel. Add the security configuration to the Spring configuration in the web.xml by updating the contextConfigLocation param-value as shown in Listing 10. At this point, you need to update the Spring configuration file to secure the getMyEntities method on myService. To do this update the application-config.xml file with the code in Listing 11. If you run the Flex® application at this point, the getMyEntities service call will fail because the user is not authenticated. Now that the server is configured to protect the service, you will update the Flex application to require the user to authenticate before loading data from the getMyEntities service method. The updated code shown in Listing 12 presents users with a login form (See Figure 2) until they are successfully authenticated. Once the user is authenticated, the view state is updated showing the DataGrid bound to the service results, and the service method is called. Update the main.mxml page with the code in Listing 12. You can then run the application and login with one of the hard-coded username and password combinations from the applicationContext-security.xml configuration file. var token:AsyncToken = channelSet.login(username.text, password. The Flex code in Listing 12 is very basic. It presents the user with the loginPanel until loginResult() is invoked by a successful login. The username and password parameters come from a login form and are passed to the channelSet’s login() method. On a successful login, the loginResult() handler function is called, and the post-login logic is invoked. In this case, the currentState is updated to userAuthenticated, which removes the login form and adds the DataGrid bound to the service call’s results. In addition, the getMyEntities service method is called to load the data. Now, you have a basic Flex®, Spring, and BlazeDS application protected with authentication.